Rootfly is a free, open-source software application to aid researchers in minirhizotron image analysis. 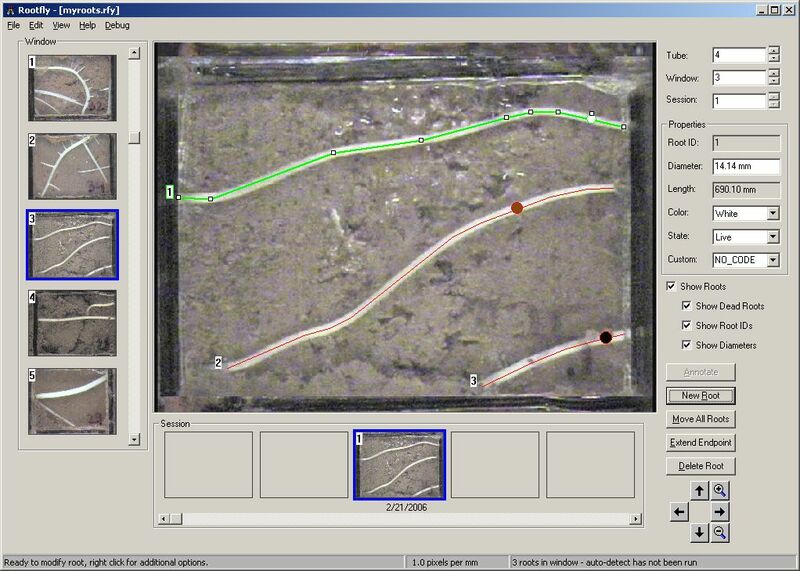 Users can use the software to measure the length, diameter, and color of roots, as well as the birth and death rates. The software is designed to be easy to use, with a minimal number of mouse clicks needed to perform each operation, and with all the data for an experiment stored in a single RFY file. Automated image processing algorithms are also included to further reduce the manual intervention required. Rootfly is released under the GNU General Public License (GPL). Warning!!! Despite the version number, this software should be considered in beta. Use at your own risk. Some users have complained about losing data, but the problem happens infrequently enough that we have not been able to track down and fix the bug. To minimize the chances of losing your data (or having it become corrupted), it is recommended that you break your dataset into smaller datasets, then frequently double-check whenever you have finished annotating a small dataset that the annotations are indeed preserved in the file. In this manner, any corruptions that occur will be limited to the smaller dataset, and you will lose less work. And of course, save early, save often, and make frequent backups. File.Rescan now gets called automatically upon image load; display format cleaned up. More importantly, when session dates are read from file or found by scanning image directory, their indices are now associated with the session number to cause the dates to be displayed correctly (used to use push_back while ignoring missing dates, which skewed the dates). Edit.Copy now allows user to copy just a single root. Bug fix: Files not containing a session/window number in the filename will now get a default session/window number assigned to them. This work was partially supported by National Science Foundation (NSF) grant DBI-0455221.